I know the default myth is that artists and the written word are mortal enemies. 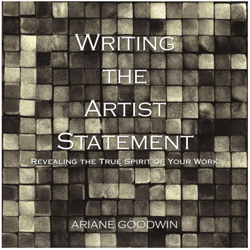 Of course I’ve taken every opportunity to shake artists free of this ignorant, if persistent, idea, beginning with my book Writing The Artist Statement: Revealing the True Spirit of Your Work. Since we humans owe our ever-evolving humanity and consciousness to our ability to communicate, and since words are the core vehicle to this communication, perpetuating any level of poverty with the written word is to tie you up with a lie. it’s necessary, or a given, or can’t be turned around. 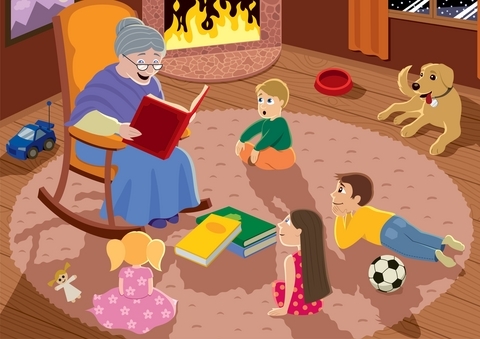 When’s the last time you heard a good story? The fact is: we humans are hard wired for story. Sitting around a fire telling stories has always been a critical way to stay connected with the tribe. And staying connected with the tribe has always been essential for survival. This is equally true for your art career as it’s tied into the people who are essential to the survival of your career—your collectors and buyers. The titles to your artwork. Titles for your work are the beginning of your non-visual communication with your viewers. And in the land where websites rule (or Facebook), words are essential. People write about their art; others comment on it—all with words. Even the newest rage, visual Pinterest, asks you to name your boards, to put words with the image you pin. Words are your true friend because they help you create more than one level of association, increasing what I call the “sticky factor,” which helps people remember you. Taste the tang of the freshly sliced tangerine. Feel the rough edge of a broken fingernail. Listen to the church bells call to prayer. See how well that works? If your title tells a story – at any level – it immediately creates connection. So, start with your titles, okay? It’s not hard at all. Find the story inside each piece you do. 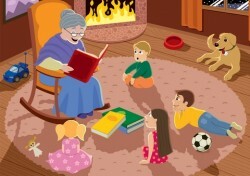 You can do this by practicing listening to the story as you work. Create the intention, before you start a new piece, that you will listen to the inside chatter of your own mind because it’s there the title will first appear. I recommend keeping a spiral notebook and pen next to you and jotting down simple phrases or single words that will trigger entire thoughts once you’re out of the studio. Or, if you have the space, unroll a huge sheet of newsprint on a wall, with a fat marker, and bounce the words/phrases off of that. Working with story inside a title is a wonderful exercise in pairing down to the essentials. It’s a simple way for you to engage with your own language, with words that mean something to you. It’s also a way for you to start to pay attention to the words you think, but don’t actually think about. Sometimes, a single word isn’t enough. You can feel the tip of its iceberg, but how can you drill down for more? If you try this exercise, I promise you’ll have more words than you know what to do with. This only works when you create a quiet space with no interruptions for a minimum of 30 minutes. 1. Light a candle (really, light a candle). 2. In your studio spiral notebook, write this Q: What do I mean by [insert word or phrase]? 3. Write an answer. As you write, notice when another word comes up that as even the slightest emotional zing to it. 4. Now, take that word and write the same Q: What do I mean by [insert new word or phrase]? 5. As you write that answer, notice when another word comes up that as even the slightest…. This is a simple, elegant way to introduce yourself to your own inner secret language. Because online people search by words, words are part of the SEO equation (Search Engine Optimization) – or, what position your website turns up in a search on Google. As I mentioned in the first post in this Confidence Series, one smARTist alumni told me that, after attending one of my smARTist Telesummit, she got two commissions just by titling her landscapes the exact names of the location where she painted them. Someone googled those areas looking for wedding gifts and found her work… need I say more? 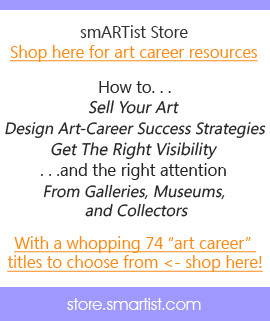 Wouldn’t it be great to get tips that actually make a difference in your art career, like the alumni above who took just one idea from the smARTist Telesummit? Artists email me all the time, about one thing and another, which they learned at the telesummit that made a huge difference for them. Click here to make this year your best year ever because you have the information you need most. thank you, Ariane! this is great input and much appreciated. Thanks for that vote of appreciation, Suzy. Was there something in particular that stood out for you? Well thought out and presented. I would expect nothing less from Ariane. Wow! I love this post. I am sitting here listening/watching IDOL. Why do I watch it periodically? Because I love listening to the WORDS the judges use in giving feedback to the singers – they talk about being an artist. I also love listening to how the judges respond to whether the singers connect or not connect with the audience. Your post just seemed to jibe with all of this. I am going to keep it to remind me of several of your well written points. Thanks! You watch IDOL and I watch The VOICE – same reason. Plus, The Voice strikes me as singularly full of compassion and heart with a real live Buddha in the mix! Yay pop culture!!! I don’t know anything about The Voice. Where do I find it. Sounds fascinating. I think it’s NBC and the last one is this Monday/Tuesday night – when the final round happens. I usually watch on demand, but since I want to vote, I’ll watch this last one live. I’m in love w/ the young rocker girl – she’s The Voice as far as I’m concerned! Brilliant stuff Ariane. Listening in to yourself while creating can and will lead to great story telling…and more than that, you may discover some inner gems that need to see the light of day. Looking forward to the next installment.